New York firm Diller Scofidio + Renfro (DS+R) has trumped nine other studios in a competition to masterplan a man-made island in Haikou Bay, China. In doing so, DS+R beat off Foster + Partners, UN Studio, and fellow New York practice Morphosis Architects to design 250-acre plot of land. 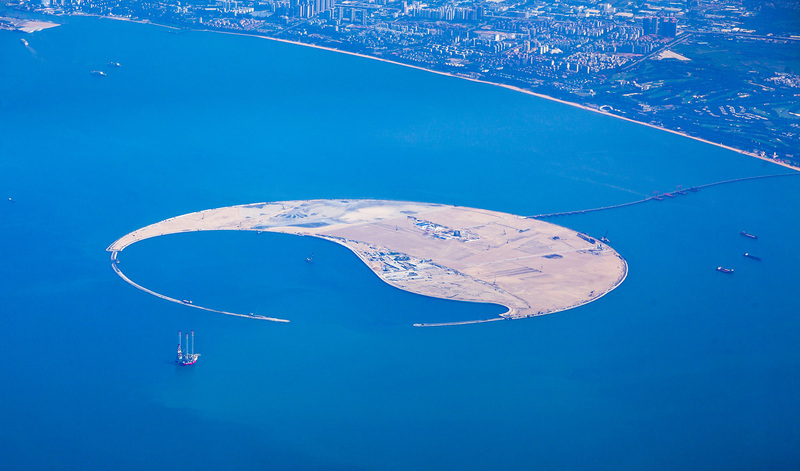 The crescent-shaped island is officially known as the South Sea Pearl Artificial Island and is located in China's Hainan province. It will be joined to Hainan—itself a large island off the south Chinese coast—by a bridge. Chinese developer HNA Group, the group funding the project, wants to create an eco-tourism hub complete with a hotel complex, theme park, yacht harbor, and cruise ship port. The total price tag will be $1.25 billion. "Our studio worked for a couple of months to imagine how to take this amount of land and how to consolidate all the building program in the smallest footprint possible, but also in a very natural land form," said Elizabeth Diller, a partner at DS+R, in an interview with Chinese news service CCTV. "It's a stitching of nature and culture together, so we’re very excited about that," she added. Meanwhile, Ni Qiang, the mayor of Haikou, spoke of the economic implications and what the project will mean to the island in a general sense. "This island will not only help boost local economic growth and create more jobs but also bring some of the world's most advanced concepts in urban development to China,” he said. Construction is expected to begin in 2017 and take approximately a decade, wrapping up in 2027. The other offices that competed were: Office of Architecture in Barcelona; Seoul-based Iroje Architects & Planners; Rotterdam-based KuiperCompagnons; Los Angeles-based The Jerde Partnership, Beijing-based CCDI, and internationally-based Boston International Design Group. 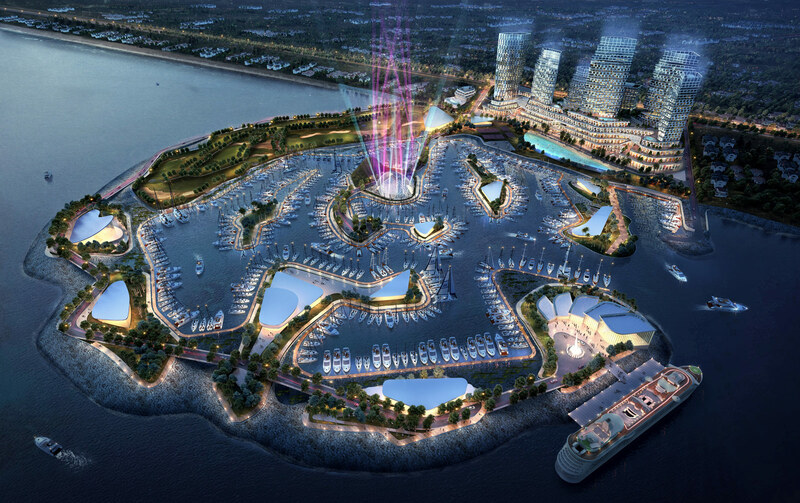 HNA Group has announced a design competition for the master plan and central buildings on a man-made island in Haikou Bay, China. The island, called the South Sea Pearl (and Nanhai Pearl Artificial Island), will be an eco-tourism hub with housing, a cruise ship port, a yacht harbor, hotels, resorts, a theme park, and more. HNA Group is the owner of several other properties in the area and across China, including the supertall skyscraper Haikou Tower due to be completed in 2020. They also own Hainan Airlines, the fourth largest airline in China. The crescent-shaped island is 250 hectares in size and located off the coast of Hainan, China, a larger island in the South China Sea with a population of 9 million. According to ArchDaily, Vincente Guallart was selected to create a strategic vision for the island. 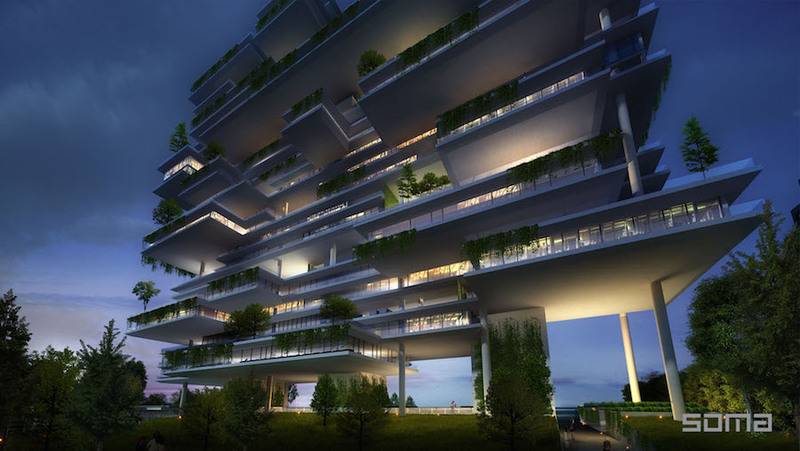 Guallart told ArchDaily the goal was to "achieve a new urban development based on ecological principles." The ten firms that will compete to design the island are London-based Foster + Partners, New York-based Morphosis Architects, Office of Architecture in Barcelona, New York-based Diller Scofidio + Renfro, Seoul-based Iroje Architects & Planners, Seoul-based UNStudio, Rotterdam-based KuiperCompagnons, Los Angeles-based The Jerde Partnership, Beijing-based CCDI, and internationally-based Boston International Design Group. Construction is expected to begin in 2017 and take approximately a decade, wrapping up in 2027. The controversial lower west side project, Pier55, just got the green light from the New York State Supreme Court this past Friday, April 8, to continue moving ahead. Last spring, the City Club of New York (a nonprofit organization) filed a lawsuit against Pier55 Inc. and HRPT to stop the project. Diane von Furstenberg and Barry Diller are major funders of the planned $130 million, 2.7 acre island of public space off of the lower west side of Manhattan. They established the nonprofit organization Pier55 Inc., and are working in a public-private partnership with the Hudson River Park Trust (HRPT). U.K. based firm Heatherwick Studio (known stateside for their collaborating with Bjarke Ingels Group on Google’s planned Mountain View headquarters) and landscape architecture firm, Signe Nielsen, are designing the project. The City Club believes the project will hurt wildlife and is against public interest. “The project would require driving about 550 piles in an area of the Hudson protected as an estuarine sanctuary,” the City Club wrote in an AN op-ed published this January. “Diller and von Furstenberg would receive a 30-year lease to operate the island as a performing arts venue and naming rights to the island in perpetuity.” In response, the Pier55 team wrote a letter to the editor, published this early February on the AN blog: “The project has also been through a rigorous and transparent environmental review process and the New York State Department of Environmental Conservation has already determined that an Environmental Impact Statement is not required,” said the Pier55 development team. “It must also be noted that Pier55’s 2.7-acre size is within the scope of what is allowed based on a 2013 law amending the state’s Hudson River Park Act. This amendment, crafted based on input from the local community board and other stakeholders, allowed HRPT to rebuild the former pier outside its original footprint.” Construction is expected to start this spring, with an opening in 2019. The top-of-the-line new residences by New York-based firm SOMA boast the tagline: “crafted for the most privileged of the privileged few”—and it’s easy to see why. Rising at the entrance to the Palm Jumeirah, one of Dubai’s artificial islands, the One at Palm consists of 90 exclusive residences, the units arranged in alternately pulled-in and pulled-out configurations across each level so that each apartment is guaranteed 360-degree views. The north side overlooks the Palm, while south-facing views sweep over the Dubai Marina. SOMA calculated these intricate configurations through an extensive process of adjacency and view studies to achieve unobstructed panoramas, uncompromised privacy, and to guarantee each unit its own private outdoor space proportional to the size of the apartment. For the most part, units are outfitted with balconies, but the design allows for the creation of several true open terraces. At 25 stories up, it is the highest residential development on the island, and will be completed in 2017 on undeveloped land on the left side of the trunk of the Palm. SOMA designed the One to be built on three separate cores that provide private access to individual units. Each core leads to no more than two apartments, while elevators to the higher floors service units individually. The penthouse goes for $54 million. 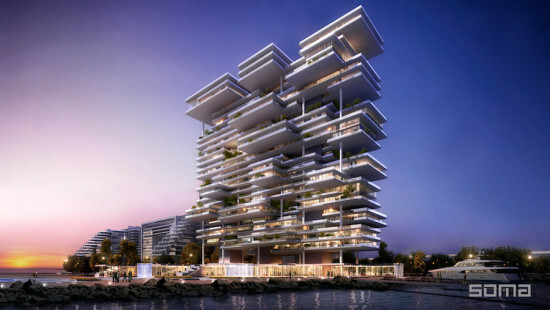 “Our design for One at Palm shatters the predictable condo tower mold of curtain-walled containers by creating private villas in the sky, offering seamless transitions between indoor and outdoor space, and capturing the most remarkable views in a way that allows each residence to seemingly float above the sea,” Michel Abboud, founder of SOMA, said at the Cityscape Global Conference at the Dubai World Trade Center, where designs for One at Palm were first unveiled. Each unit features multiple entrances, wall-to-wall glass ceilings that flaunt the seafront views, and a double-height ceiling in every living room. Units at certain stories open up to a glass-enclosed infinity pool, tanning bed, and outdoor lounge area. The interiors by Japanese firm Super Potato juxtapose nature and steel, while the landscape architecture will be the handiwork of Vladimir Djurovic. Facilities include an indoor and outdoor pool, a cinema, cigar lounge, super luxury spa managed by ESPA, and a yacht club. Finally, residents can customize their unit with the best Poltrona Frau has to offer after a private consultation session with an interior designer. The $680 million project is a 50-50 joint venture between Omniyat group and Drake & Scull International. Amsterdam’s overflow population will soon have a roof over its head—and artificial sand bars beneath its feet. Europe’s boldest engineering and housing program yet proposes a series of artificial islands built over Ijmeer Lake, with shoreline houses occupying sand bars made using a so-called “pancake method.” The local vernacular refers to a method of spraying sand through porous screens to form a layer of batter-like sludge. As the layer settles and drains through the fine mesh, it hardens and another layer is sprayed on top. Pancake by pancake, the artificial island rises until it is six-and-a-half feet above water level. So far, six of the total 10 planned islands are complete, although not entirely built up or populated to maximum capacity. The islands are covered with low and medium-rise housing and self-build plots, while floating homes flank its edges. The three main islands contain urban streets and mid-rise buildings, with the smaller islets between the main islands and the coasts featuring a more suburban character. On the islets, low-rise single-family homes line the shore, which will soon receive a cover of foliage and reed banks. Each island is thin in order to maximize views of the Ijmeer, but environmentalists still bristle at the threat posed to one of the scenic highlights of the Netherlands – also a vital habitat for birds. Construction of the final four islands, knowns as Ijburg Phase II, is finally due to commence after an interval of more than a decade. Officials commend the interim between Phases I and II as a learn-and-grow buffer against construction pitfalls associated with the pancake method. In bad weather, the screens holding the island’s shape would rip and leach sludge onto the lake bottom, threatening the integrity of the island and the mussel beds below. 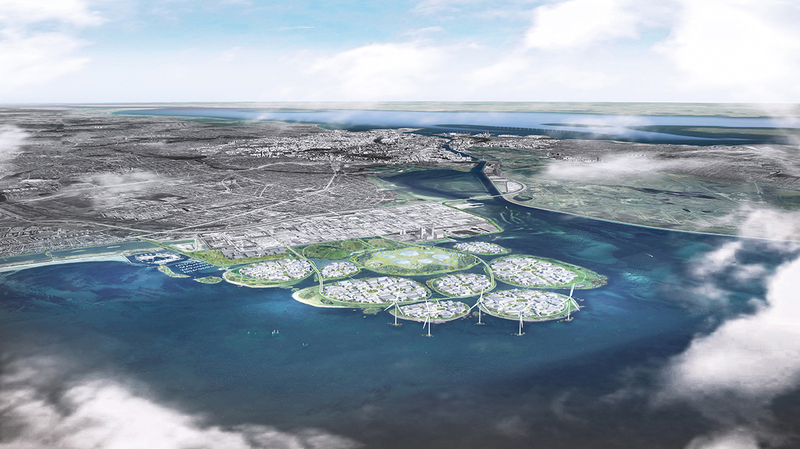 To avoid these goof-ups for the next big island on the assembly line, called Center Island (Centrumieland), the Dutch government amassed public input for a year while consulting with the Amsterdam Architecture Center. Slated to begin construction in 2017, after the last pancake layer dries, Center Island will host 1,000–1,200 homes. A range of local architects undertook designs for housing across the various islands, from MaccreanorLavington to Atelier Kempe Thill, VMX, and Architectenbureau Marlies Rohmer. A 1,967-foot breakwater has been built to the east of the island to protect the sludge screens by sheltering them from the current. Future islands will feature more vegetation cover, with more low than high-rise settlements and a band of green around their fringes to preserve lakeside views. Meanwhile, developers have considered a uniform implementation of solar cells and district heating, while ceding more real estate to self-builders, who are more likely to install well-insulated, eco-friendly heating and wastewater systems. Today, three more islets called Outer, Middle and Beach Islands (Buiteneiland, Middeneiland and Strandeiland) are also in the pipeline. The first island was inhabited in 2002, and the city’s tram network extended to the islands in 2005, bringing the former backwater within 15 minutes of Amsterdam’s Central Station.